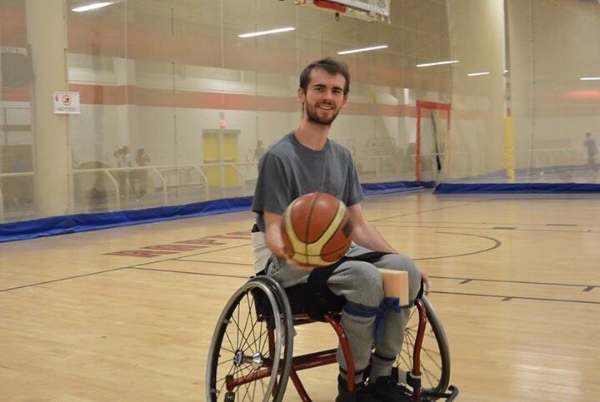 This fundraiser has been created to support Lee Melymick, youngest son of Mark Melymick and Terry Haubrich, who sustained a spinal cord injury resulting in complete paralysis from the waist down on June 23, 2015. Lee is one of the most determined individuals you would ever meet, and has his heart and mind set on regaining use of his lower body! The only way this is at all possible with a complete spinal cord injury is with possible benefits of stem cell surgery. Although still in experimental stages, stem cell surgery is showing much promise in various hospitals out of the country. Since this procedure is in early stages it is, of course, expensive and not covered at all by insurance or other institutions. It is also presently only offered outside Canada and the U.S. Stem cell surgery saved Gordie Howe after his stroke – and there are many new developments in China and England as well as other parts of the world in stem cell research as a possible treatment for spinal cord injuries. With the permission of Lee and his family, we are setting up this fundraiser to appeal to family, friends, colleagues, and anyone willing to help make a difference to raise funds for travel to receive possible surgery and any additional rehab costs needed to help Lee to regain as much function as possible. Much research will be done before choosing where and when to go, to ensure all is legitimate and progress for Lee is definitely possible! Please share this campaign and story and support Lee in his progress and recovery. Lee has always been an impressive athlete. In high school he was a leader on senior football, basketball and baseball teams. His coaches still speak of him as one of the top athletes they have ever coached. He was also an honour’s student and impressive academically as well. After high school he was accepted into several University Engineering programs, but chose Ryerson so he could live at home and save money. He played baseball for Ryerson during first year and played for Leaside junior team in the summer. He was a top hitter for Leaside, and also pitched when needed. This spring he was throwing harder than ever and hitting well again for his team. He loved paying baseball and was thrilled being an important asset for the team. To help pay for the costly Engineering program at Ryerson, he needed a summer job and in May, he thought he was lucky to land a job cleaning windows and eaves. On June 23, 2015, Lee Melymick was seriously injured in a workplace accident after a fall from over 20 feet. His spinal cord was completely severed and he was diagnosed immediately with complete paralysis from the waist down. At times his pain was unbearable. There were several complications and problems that occurred and additional surgeries and medical procedures were required. There were also many times all involved were not sure Lee would be able to survive this ordeal, but he did. During his 70 days in trauma hospital he lost over 70 pounds. Lee went from an athletic strong 210lbs to a fragile 135lbs on his 6’4” frame. Finally, after a third surgery in early August, Lee began to slowly make healing progress. He was able to move to a trauma ward and out of intensive care. In early September, Lee was released from trauma hospital and moved to a rehab facility, where he is still receiving physiotherapy and occupational therapy. While the costs of the actual medial care will be provided by Workplace Safety Insurance Board (WSIB), there are many associated costs that are not included—like purchase of a special vehicle, medical procedures out of the country, some alternate rehab, etc.—and it does not cover any stem cell treatment. Payments by WSIB are based only on lost wages, and nothing is allotted for pain and suffering. His dad Mark has even met with MPP and senior advisor to Minister of Labour in an attempt to change legislation to be more helpful to worker’s who obtain serious injuries. This will take years. Support from all who know Lee or any of his family members is extremely meaningful and appreciated by Lee and all his family. The “Stand by Lee” slogan is a play on the old popular song “Stand by Me” and the old military expression “Leave No Man Behind” is the slogan that Lee’s close friends have put on T-Shirt’s to let him know they will indeed stand by him and not desert him in time of need. It is a perfect description of the incredible support that has been there for Lee and his family since the day of his accident, from his family, friends and community. Lee is a 20-year-old, third year Engineering student at Ryerson University, and is the son of Mark Melymick and Teresa Haubrich and brother to Luke. He grew up in Toronto and attended Sunnylea Junior School, Norseman Middle School and Etobicoke Collegiate Institute. In high school, he maintained honour roll grades and was a team leader on the football, basketball and baseball teams. He spent every summer of his youth visiting family and friends in Saskatchewan, where he took also took swimming lessons and attended baseball camps. He was given numerous academic and athletic awards and accolades in high school. Last year while in second year Engineering Ryerson, his team of four won the Junior Engineering competition then represented Ryerson in the province-wide competition. In addition to working during the summer, Lee was also a valuable member of the Leaside Junior Baseball team. Those who have met Lee, know what an amazing individual he is. His quiet, calm, kind, intelligent nature has impressed all who have met him through his 20 short years. Canadian Actor Kim Coates, and Man in Motion Canadian hero, Rick Hansen, have both made visits to see Lee in hospital and both have been greatly impressed and impacted by how Lee has coped and handled this tragic injury. His incredible positive attitude has brought many to tears. Lee is bright, kind, hardworking and has so many other qualities, and he deserves to have the best opportunities to recover and improve. There is no doubt that what he will achieve in the days, months, and years ahead will impress beyond expectations! He and his family are grateful and thankful for any support you can offer. Please only contribute what you can afford and an amount you will not miss, or notice is gone. The total cost of travel, surgery and associated rehab is still note certain, but will most likely exceed $80,000. The family will somehow cover any shortfall. If there is an excess of what Lee needs, funds will go directly to spinal cord injury research to help others. Lee’s parents—both teachers—have both dedicated their lives to helping others, and now they need your help. This is an opportunity to help someone who truly deserves a break, and help spread awareness of problems after spinal cord injuries! Our other hope is this will help bring this the spotlight back on trying to find a cure/solution these horrible injuries that plague far too many! Thank you so much for any help you are able to offer! We encourage those so inclined to set up their own creative fundraising events for “Stand by Lee” and then contribute funds raised. One idea that came up that would be fun (and cheesy, in a good way) is for the singers out there to record a video of a version of “Stand by Lee” and we can post a compilation for all to see. Thank you all for helping Lee in any way you can! Just as long as you stand, stand by LEE. Oh stand by Lee, stand by Lee. 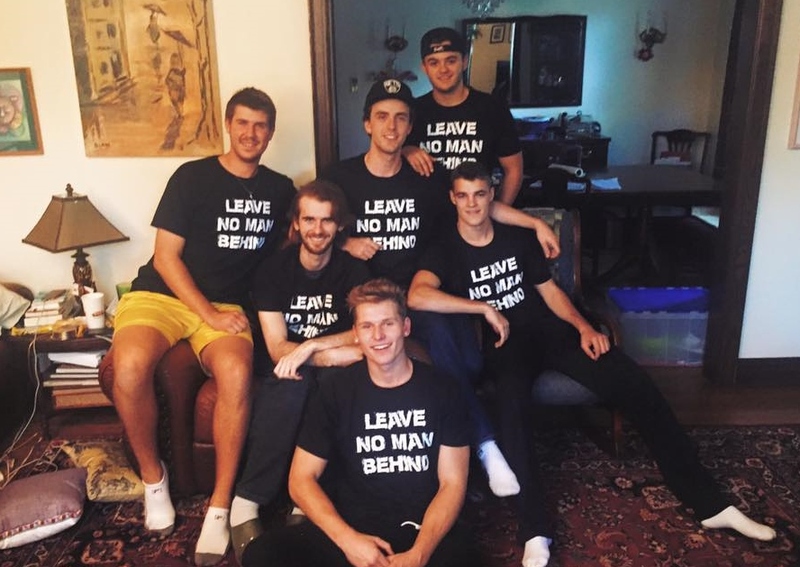 Lee's friends made these 'Leave No Man Behind' T-Shirts and brought them over when he was home on a pass at Thanksgiving. Below is poster for Canadian Abilities Foundation Fundraiser event for Lee on May. Please pass on and plan to attend - there will be lots of entertainment for all to enjoy! Special Guest host, Kim Coates will be available for photos, autographed Son's of Anarchy photos, etc. Come out and meet these great people in support of Lee and Canadian Abilities Foundation! Some great entertainers that will be in attendance are David Merry, Victor A. Young, Michael Vanhevel, Washboard Hank, Dave Comeau, Ray Xu, Jillian Dowding, Rob Sapienza, and Charlin McIsaac. Live Auction with David Sparrow - Also a few surprise entertainers! This is going to be an amazing variety show to see. The price includes food and one drink , entertainment and a few fun surprises. Cash bar, many awesome items for silent and live auction are being acquired as well! The CANADIAN ABILITIES FOUNDATION Charitable Reg. No. - 12608 1140 RR000 is a much needed Canadian charity for all disabilites! We are extremely grateful to event committee members, Alan Goluboff, David Sparrow, Stu Miller, Barbara Kaufman, Caroline-Tapp McDougal, Tim Progosh, Anna Bratt, Tracy Bowie, Chantal Cadeny, Kristina Yusupov, Glenda MacFarlane and all of us are thrilled Lee Melymick is being honored this year!! This is sure to be one of best events and parties of the year, so please get your tickets and plan to attend! 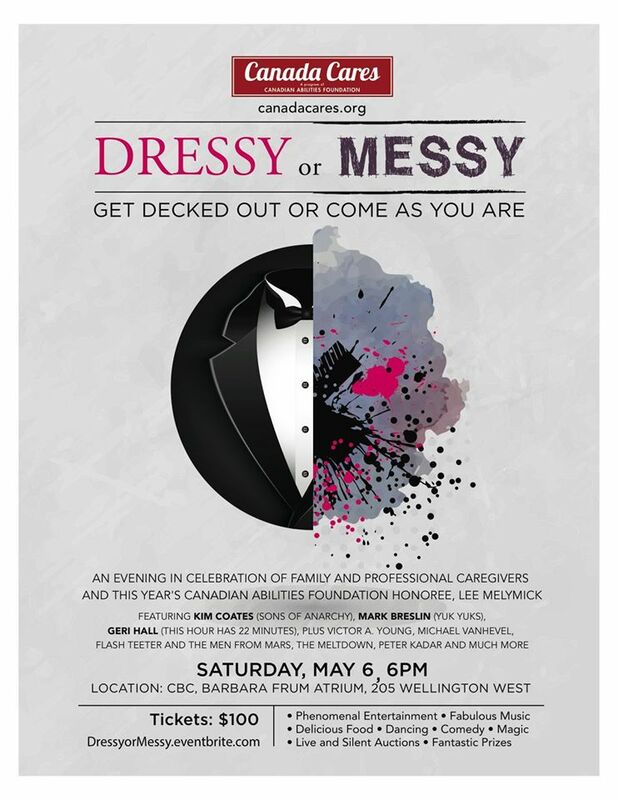 tickets available at www.DressyorMessy.eventbrite.com or from a committee member price includes food, a drink and all this amazing entertainment! So some of you might be wondering what Lee has been up to. If you haven't had the opportunity to already, please go to the link below from the Global Toronto's August 22nd evening news to see the clip of their "Making a Difference" segment, and see how far he has come this past year, and how he is inspiring so many with how he is living his life. I know I can speak for many when I say how proud and inspired I am of Lee! The written news story from video clip is below, but make sure you go watch or you will be missing out! "Like any young person, getting yourself through school can be costly – a prospect that inspired Lee Melymick, a third-year Ryerson University engineering student, to take a summer job cleaning windows and eavestroughs. That was a year ago, and today Lee is learning to live life differently. He fell approximately 20 feet that day, and the news that followed was devastating. After several surgeries, Lee was released from trauma hospital last September and moved to a rehab facility. More than a year later, Lee still receives physiotherapy and occupational therapy. Despite everything he has been through, Lee has persevered with the support of his family and friends. Before the accident, Lee was a strong player for the Leaside baseball team. Loved by his teammates, they decided to honour him with a special tribute last month where Lee threw the ceremonial first pitch. A GREAT BIG THANK YOU TO ALL! There will be fundraisers for Lee in Toronto and Saskatoon this year. No date for the Toronto fundraiser yet (sometime in May I am told), but there will be one in Saskatoon on April 23, organized by Mitch Parkinson, Ron Krysa and Shelly Leoffler. Thank you Mitch, Ron and Shelly! "Quick update -This past Wednesday, Lee wrote his Thermo-Dynamics exam - He wanted to take at least one of his Engineering classes last fall - Since he was unable to attend classes, he read lectures online and did all assignments on his computer from hospital bed; He was in hospital when the exam took place and unable to attend, so he had to write exam at later date... The Chemical Engineering Head from Ryerson came to our home to supervise exam on Wednesday, as Lee is still not mobile or pain-free enough to to be out much or up in wheelchair for long periods... He feels he did well - exam results not back yet...extremely impressed Program chair would come out so Lee could write exam - Thanks Ryerson! Again much thanks to all who have supported Lee in any way! We all have our ups and downs, but are all doing so much better with Lee home. www.gofundme.com/standbylee." Great update from Lee today on his 21st birthday! So thankful for this guy. Happy birthday buddy! "Today is my 21st birthday and i'm lucky to have seen it as alive and well as I am. As just about everyone knows I had an accident this summer where I fainted and fell 20 feet off a ladder. I sustained a complete spinal cord injury and am now paralyzed from the waist down. I could have easily had a serious head injury or even died but I didn't and I am grateful that. I am also grateful for the hundreds of people that have supported me through recovery. I would like to thank my mother, father and brother who have been doing everything they can to help me since the day of my injury. I would like to thank my relatives for their support including some that flew all the way to Toronto to help. I would like to thank my friends for visiting me in the hospital and even making T-shirts for me that say "leave no man behind". I would like to thank all of those who sent a card to me, I read everyone of them and they made a world of difference during my recover. And I would like to thank the people who I hardly know or don't even know that heard my story and wanted to help. I have learned that people are more generous than I could have imagined and I'm not sure if I would have ever learned this if not for this experience. I only hope I can give to others one day as much as I have been given. Thank you." Smiling Lee at basketball practice! Update - Lee will be featured in Make a difference segment produced by Susan Hay on Global TV next Monday Aug 22 5:30 EST - Also should state how amazing Lee is getting at Wheelchair basketball! I also wanted to let everyone know Lee is paying Wheelchair Basketball three times a week now! JUSt another Big Thanks to all contributing!!! You can't imagine how these contributions help Lee's state of mind and well being ! He is so grateful thee will be funds for him to get to where he needs to be when Stem Cell treatment is ready for humans...Knowing he has support from so many lifts his mood more than you fathom! Thank you again and again!! Below is messge from Lee: Today is my 21st birthday and i'm lucky to have seen it as alive and well as I am. As just about everyone knows I had an accident this summer where I fainted and fell 20 feet off a ladder. I sustained a complete spinal cord injury and am now paralyzed from the waist down. I could have easily had a serious head injury or even died but I didn't and I am grateful that. I am also grateful for the hundreds of people that have supported me through recovery. I would like to thank my mother, father and brother who have been doing everything they can to help me since the day of my injury. I would like to thank my relatives for their support including some that flew all the way to Toronto to help. I would like to thank my friends for visiting me in the hospital and even making T-shirts for me that say "leave no man behind". I would like to thank all of those who sent a card to me, I read everyone of them and they made a world of difference during my recover. And I would like to thank the people who I hardly know or don't even know that heard my story and wanted to help. I have learned that people are more generous than I could have imagined and I'm not sure if I would have ever learned this if not for this experience. I only hope I can give to others one day as much as I have been given. Thank you. Again thank-you all for posting - I know mt Niece is sending individual thanks to all who donate as she is administrator and has list - but I want to make sure all know we are greatly appreciative for all donations big and small - and are aware that many who have donated small amounts are often HUGE percentage of what they have themselves - THANK_YOU to ALL! Once again We are truly thankful for all donations!! Many have been sent to us offline as well - and a couple very large cheques!! : bringing the total to close to $70,000 in total!! !Merry Christmas and Happy Holidays to all! Thank -you Everyone so much for donations!! I am deeply grateful for large donations! But also have to say I am equally touched and grateful by those who have little [ie-students!] who have very little but still are contributing!! I know and remember what it was like to have so little - so these contributions are truly heart-warming and helpful!!! If we could get 8.000 people contributing $10.... I am in tears thinking about the generosity of those with so little themselves!! Thank-you to all - We will reach the goal with all your help!! I was just out for a walk with a friend and we walked by Lee's home. I saw the ramp. My friend told me about Lee. I googled his story and have so much admiration for Lees strength and courage. I use to teach Lees brother Luke piano in the Music For Young Children program. I have fond memories of Luke and his mom Terry. Sorry we couldn't make it out last Saturday. Congratulations on an awesome event and continued success with your Basketball prowess!!! Huge congratulations to Lee. You are an inspiration! Much love and admiration to you and to your family. Sorry Alan & I can't make the fundraiser. We are in Arizona visiting friends.